Keep in mind that there’s a chance that anything you post online may potentially exist online forever. Even content that has been deleted can still live on in caches and archives. In fact, I was able to track down my very first website from the 90’s using the Wayback Machine. This was not something I ever agreed to or signed up for, but by creating a website, my content was inadvertently recorded in the archives of web history, fluorescent graphics and all! So I can’t stress enough to remember that any time you post anything online, whether you like it or not, it can live in cyberspace forever! 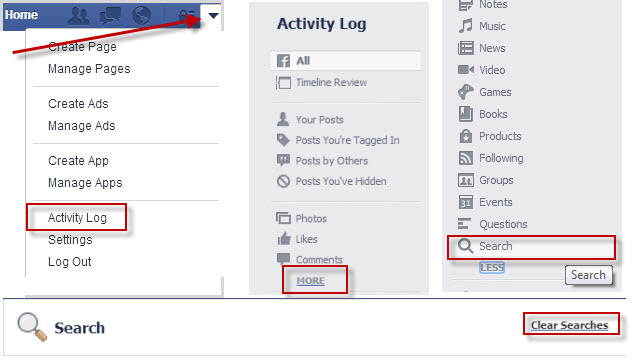 You may not realize this, but Facebook keeps track of everything you search for on the site. One of the reasons is to make your search queries easier to find in the future, but it’s hard to say what else these results could be used for, especially if you share your computer with others. And while the search results are private to your own account, they’re still floating around in cyberspace. It takes a few steps to clear your Facebook search history, but it will remove everything you’ve searched for in the past that you may not want showing up to someone with access to your account or if someone is watching over your shoulder while you try to show them something. If you haven’t carefully read Facebook’s Statement of Rights and Responsibilities, you may want to take a gander. Especially the part where you agree to allow them to use your content even if you delete your account. Oh yeah, and they reserve the right to use your information for advertising because you agreed to allow it when you signed up. But let’s not get all paranoid and conspiracy theory here. As a Facebook advertiser myself, I appreciate the ability to tell your friends that they should like something because you do, and use your name and profile photo to back it up. Because if you “like” my page, you’re pretty much acting as an advocate for it. And when Facebook asks you about your interests, it’s not because they want to help you show off, it’s so advertisers can target you more effectively. Want to limit this ability? The best way is to limit the pages and content you “like” through your Activity Log. Your “Pages and Interests” section show all the pages and interests you’ve liked and allow for you to unlike them by clicking on the edit pencil icon. Keep in mind that once you do this, you will no longer see posts from these pages in your timeline, so if you want to continue to see those posts, just know that they could use you for advertising. 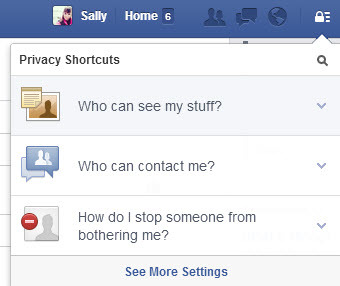 Never assume that Facebook automatically chooses the best privacy settings for you. Also keep in mind that Facebook privacy settings have changed periodically over the last several years, so while you may have checked your settings when you signed up 6 years ago, your settings may no longer be as secure as you think. The good news is that Facebook makes it pretty easy to check and adjust your settings. Just click on the padlock on the top right side of your screen and click on “Who can see my stuff?” to view your settings. You can even view your account to see what others are able to see and make adjustments from that. Click on See More Settings to view all your privacy options and adjust from there. Additionally, visit this section every few months to make sure your privacy settings are how you want them to ensure you’re getting the privacy you want. When I was young, the internet barely existed and even into college, sites such as Facebook and Myspace really weren’t in existence and weren’t important. If my friends or I made dumb decisions, the chances of them being posted in public for anyone to see were slim to none. We didn’t have camera phones (did they even exist then?) and there wasn’t an urge to share every thought and activity online. If we did take photos, they were on a real camera with real film and they better not be too distasteful or we would not be able to get them developed (or worse, we would and maybe the developer would keep a copy!). So we had checks and balances to keep us inline so as not to destroy our reputations publicly, other than our school and public records. Nowadays, photos and videos can be taken and instantly uploaded to the internet and spread, potentially damaging a person’s reputation in a matter of minutes. It can be hard to convey this to kids who are constantly surrounded by social media and even explaining the consequences can make little impact. Facebook has a helpful Family Safety Center to help parents work with kids to make sure they’re making good decisions about what they’re posting online and to explain privacy settings. If you have kids who are or want to use Facebook, review the tips provided and keep a close eye on what your child is posting online. Also keep in mind that what your child posts online can affect you and your reputation as well, like this girl whose Facebook post cost her family $80,000. Something else to keep in mind is what will happen when you are no longer of this earth. Just as we draft wills to be executed on our passing, it’s a good idea to consider what you want to happen to your online accounts when your time comes. 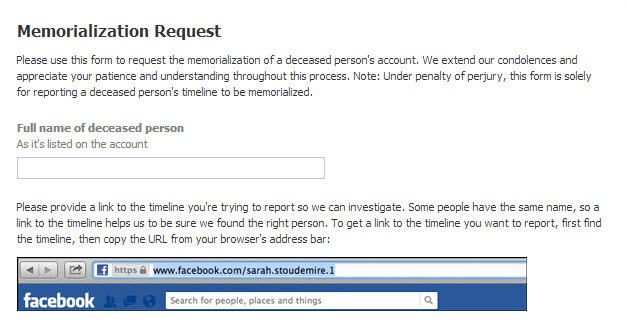 Facebook offers the ability for friends or family members to send in a memorialization request, however if you don’t want certain parts of your account or even your Facebook account to live on after you, it’s a good idea to have a plan in place in the event you unexpectantly pass. It might be wise to keep a list of online accounts with login information and passwords printed out and stored with your important documents, along with your requests of what you would like done with the accounts once you are no longer able to manage them. There’s so much uncertainty of who can access information and how long information will be online so the best practice is to be very vigilant of what you post online. I highly recommend Googling yourself to see what comes up online and removing whatever you don’t want to be seen by potential employers as well as friends and family members. The more aware you are of what’s out there, the more you can make adjustments to control what others are able to see about you. Hi Debora! I’m using WordPress with a custom domain. You can get a WordPress blog for free and a custom domain for about $18 a year. There are additional services you can purchase, but it doesn’t take much to get going.